Yes! Duh! About time! Of course! Why didn’t I come up with this! I’m amazed by startups daily, but every so often one comes along that causes me to shout aloud gleefully. This is exactly what happened when I first glimpsed PressKitHero. I didn’t even need to read beyond the name to grasp what the company was about and to jump completely onboard. Admittedly, I have a great personal stake here. I review startups every day, and I’m constantly baffled when companies don’t have a press kit. I know, I know, Founders have a million things to do and limited budgets. Product and customers come first. When I really get confused, though, is when someone reaches out to me for coverage and doesn’t have a press kit. Happens all the time. For those unsure of where or how to get started, this is the place. PressKitHero is where you can add your videos, logos, awards, press releases, recent press coverage. You’re even spared the step of compiling content using another hosting service like Dropbox. PressKitHero hosts your materials for you. In one journalist’s humble opinion, it’s never to early to begin putting a kit together. Having specialized in writing up early stage startups, I can tell founders that a press kit in place has often proven the deciding factor when choosing whether or not to write about a company. I’m always short on time. Though I love to chat with creators, it’s just not possible to speak with everyone. I have deadlines and too many startups on my desk to address. So, if I can grab information without taking the extra steps of requesting details and awaiting a reply, I’m a happy happy man. What’s more, the Internet is a visual space. I can’t tell you how much I appreciate having screenshots and videos ready to share. And who wants dig around for content each time a press opportunity arises? No one! Maintaining a press kit saves everyone hassles. Ready to stand out for your professionalism, even if you’re just beginning? 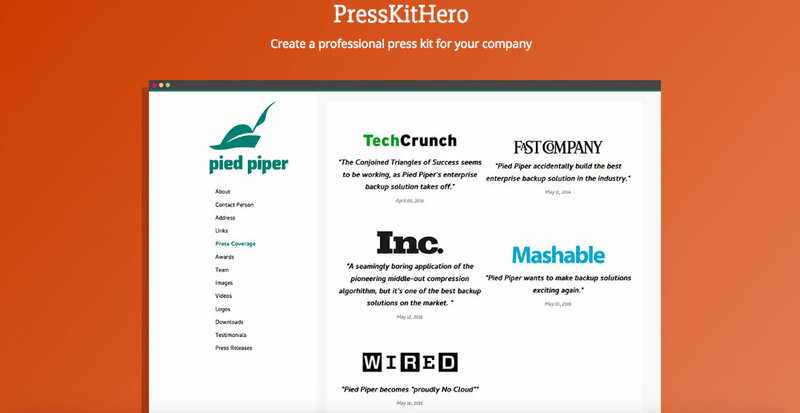 Let PressKitHero walk you through creating a press kit. Journalists will have everything they need within easy reach and you’ll have an infinitely easier time gaining the attention your startups need.